Oklahoma Baptist University (OBU) will long remember March 2 as the school became the first ever to claim four NAIA titles on the same day, sweeping men’s and women’s indoor track, as well as men’s and women’s swimming and diving. OBU Track Coach Ford Mastin was named NAIA Coach of the Year for both men’s and women’s teams. Adam Godwin won the Men’s Most Valuable Performer of the meet, while Akela Jones won the Women’s Most Valuable Performer. 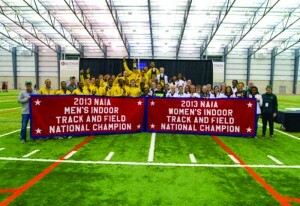 For OBU, it was the fifth NAIA Indoor Track Championship for the Lady Bison and the first for the men. 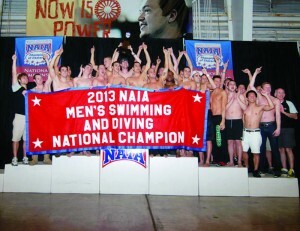 The men’s swim team won its second consecutive title, while the OBU women captured their first championship. The teams are coached by Sam Freas. The special Saturday also included the 500th coaching win for OBU softball coach Pam Fink. At the Oklahoma City Community College Aquatics Center, the Bison men won with a final team score of 881. Condordia (Calif.) finished runner-up with a team score of 448.5, barely edging out Olivet Nazarene (Ill.), who finished with 428.5. On the women’s side, the Lady Bison finished with a team score of 845, followed by SCAD Savannah (Ga.) with 600. Cumberlands (Ky.) came in third with 367. The Bison’s Daniel Ramirez established a new national record in the Men’s 100-yard freestyle. The only other record that fell Saturday was the women’s 400-yard freestyle relay. The Lady Bison established a new top time in the event with a team of Laura Galarza, Emma Forbes-Milne, Lisa MacManus and Nicole Wilson. OBU’s Galarza of Oklahoma Baptist won the swimmer of the meet award, while fellow Lady Bison teammate MacManus was awarded the swim of the meet award for her performance in the 100-yard backstroke. OBU’s Ramirez captured both individual awards for the men, with his performance in the 100-yard backstroke winning the swim of the meet. Ian McNair of Illinois Tech won the award for men’s diver of the championships, with the women’s award going to Kristen Brimage of Oklahoma Baptist. At SPIRE Institute in Geneva, Ohio, OBU become the fifth different school to sweep the men’s and women’s team indoor track championships and first since Azusa Pacific (Calif.) in 2004. 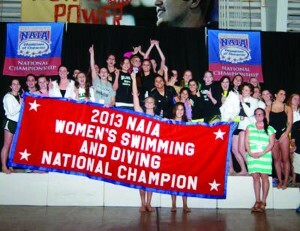 The OBU women took home a record-tying fifth national championship and the men hoisted the banner for the first time. There were five men’s and women’s national championships records set during the event and one additional SPIRE Institute facility record. OBU head coach Ford Mastin was named the Men’s and Women’s Coach of the Year after his teams won by sizable amounts. His men tallied 86.50 points to stave off defending national champion Wayland Baptist (Texas) by 16.50 points. On the women’s side, the Bison held a 113-87 scoring advantage over second-place Indiana Tech. OBU’s Adam Godwin and Akela Jones were named Most Valuable Performers of the meets. Godwin and Jones were not the only Bison to make a splash. Jura Levy put her name in the record books with four career individual titles after she defended her championships in both the 60-meter dash and 200-meter dash. She becomes the eighth female to capture four career championships. With seven individual titles, the OBU women become the third different program to garner seven, joining Azusa Pacific and Jackson State (Miss.). Missouri Baptist landed eight titles in 2006. Levy broke the NAIA national record in the 60 meter run with a time of 7.24. Godwin defended his one-mile run title with a mark of 4:10.84. He added another top finish in the 3,000-meters. View more articles by Guest Writer.